In My Hand I Hold A Ball, White And Dimpled, Rather Small. Oh, How Bland It Does Appear, This Harmless Looking Little Sphere. By Its Size I Could Not Guess, The Awesome Strength It Does Possess. But Since I Fell Beneath Its Spell, I’ve Wandered Through The Fires Of Hell. My Life Has Not Been Quite The Same, Since I Chose To Play This Stupid Game. It Rules My Mind For Hours On End, A Fortune It Has Made Me Spend. It Has Made Me Yell, Curse And Cry, I loathe it, And Sometimes Want To Die. It Promises A Thing Called Par, If I Can Hit It Straight And Far. To Master Such A Tiny Ball,Should Not Be Very Hard At All. But My Desires The Ball Refuses, And Does Exactly As It Chooses. It Hooks And Slices, Dribbles And Dies, And Even Disappears Before My Eyes. Often It Will Have A Whim, To Hit A Tree Or ! Take A Swim. With Miles Of Grass On Which To Land, It Finds A Tiny Patch Of Sand. Then Has Me Offering Up My Soul, If Only It Would Find The Hole. It’s Made Me Whimper Like A Pup, And Swear That I Will Give It Up. 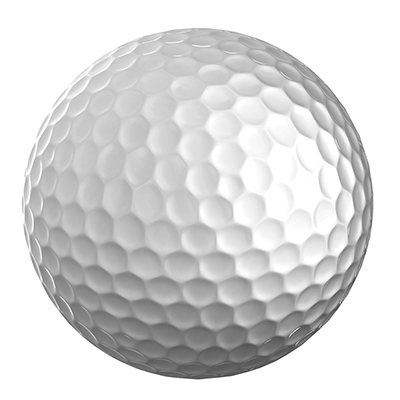 The average golfer loses two golf balls per round for a worldwide total of approximately 2,465,752 every day. Worried about running out ? – Don’t be. Companies like Titleist are working hard to ensure that never happens. Titleist makes 1.2 million golf balls each day. Stand proud you noble swingers of clubs and losers of balls. Kind of makes you proud. You’re like…. a hybrid!